Now serving lunch and dinner Tuesday through Saturday. 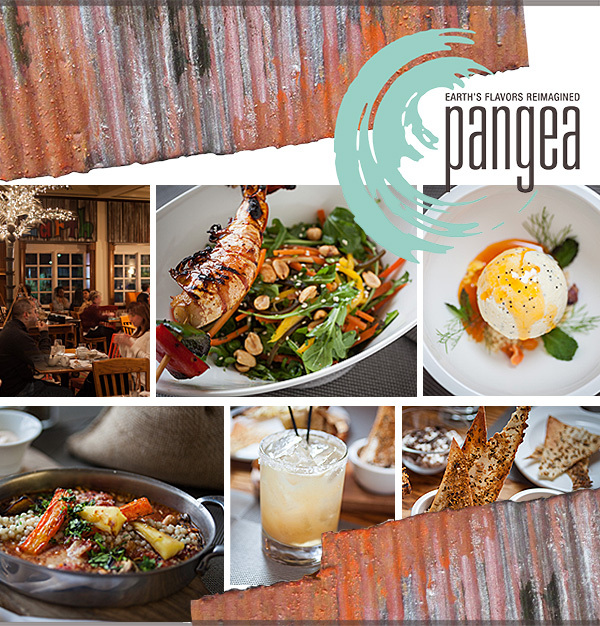 visit pangeany.com or call 845-451-1015. Come spend “A Night Under The Southern Stars,” a charity event hosted by the seniors of the 2016 graduating class of The Culinary Institute of America. The event will take place on February 13, 2016 at 6 p.m. with a cocktail hour and silent auction to raise money for Project LIFE and the CIA’s Side Towel Scholarship. If you would like to donate items for Project LIFE, they request donations of winter gloves, scarves, winter hats, and ear muffs for the winter weather. There will be baskets available near the registration desk at the event if you wish to donate. Dress Code: Cocktail attire suggested. Price: $95 per person includes four courses, all beverages, tax, and service charge (a portion is tax deductible). Please note: This event is limited to 120 guests and CIA gift cards/certificates are not redeemable at this event. Reservations: For questions about the event or to be added to the wait list, please call 845-905-4673. Messages are checked daily. This event is presented by CIA bachelor’s degree students. These future stars in the hospitality industry are responsible for all of the evening’s planning and execution, from menu development to the overall ambiance and design of the event. For questions about the event or to be added to the wait list, please call 845-905-4673. Imbibe: The End of Prohibition is a charity event hosted by the senior class of The Culinary Institute of America. This event has been inspired by the 82nd anniversary of the repeal of Prohibition in 1933. 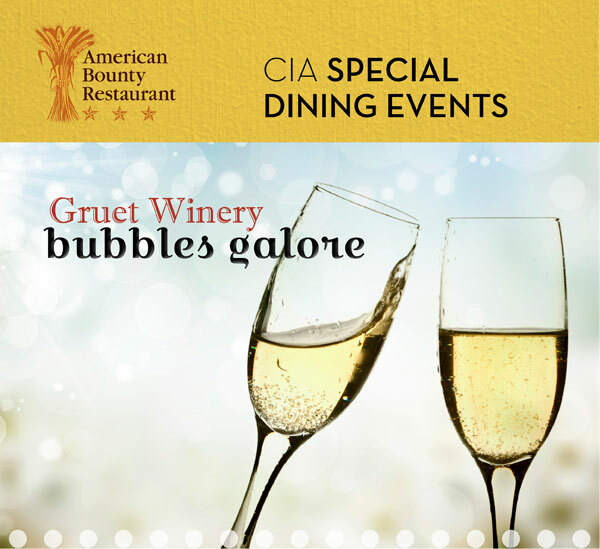 Throughout the evening, CIA students will transport guests to the era with specialty cocktails, passed hors d’oeuvre, and a silent auction. Following the reception will be a four-course meal accompanied by live music from the Big Band Sound, a 20-piece jazz orchestra based in the Hudson Valley. Proceeds benefit the CIA’s Bachelor of Professional Studies Scholarship Fund and Kidney Cancer Canada. We chose this charity due to the close impact it has had on one of our classmates from Canada whose father recently lost his battle to cancer. Reception & Silent Auction: 6 p.m.
Price: $95 per person includes hors d’oeuvre, four-course dinner, dessert, beverages, tax, and service (a portion is tax deductible). Please note: CIA gift cards/certificates are not redeemable at this event. Reservations: Make a RESERVATION NOW—for questions about the event, please call 845-905-4674 to leave a message. Messages are checked daily. This entire event is conceived and executed by CIA bachelor’s degree students in the senior class of The Culinary Institute of America, as part of their capstone Foodservice Management course. These future stars in the hospitality industry are responsible for all of the evening’s planning and execution, from menu development to the overall ambiance and design of the event. Make a RESERVATION NOW—for questions about the event, please call 845-905-4674 to leave a message. Messages are checked daily. The senior class of The Culinary Institute of America presents Cheers to the Beers. The students will be hosting a cocktail hour, four-course meal complete with beer pairings, and a silent auction. CIA alumni and guest speaker Adam Dulye ’98, executive chef of the Brewers Association, will speak on the compatibility of craft beer and cuisine. Setting the mood throughout the evening will be a local guitarist and violinist. All proceeds will benefit Arts Mid-Hudson and CIA scholarships. Reservations: Make a RESERVATION NOW—for questions about the event, please call 845-905-4672. Make a RESERVATION NOW—for questions about the event, please call 845-905-4673. October 31, 2015 at 6 p.m. The senior class of the management program at The Culinary Institute of America invites guests to spend Halloween with the Phantom of the Opera. 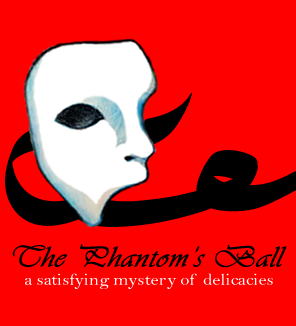 The Phantom's Ball will begin at 6 p.m. with a reception featuring hors d'oeuvre and craft cocktails and then move into a three-course dinner with paired beverages plus dessert. Entertainment will be provided by Big Band Sound. Prizes will be awarded for the best dressed male and female guests. This event will benefit the Miles of Hope Breast Cancer Foundation and the CIA Side Towel Scholarship. Please join the students of The Culinary Institute of America for Harvest on the Hudson, an evening at the CIA in Hyde Park celebrating the bounty of the fall. The evening begins with an outdoor reception and silent auction overlooking the Hudson River, followed by a four-course dinner in the college’s Farquharson Hall featuring foods from local farms. Hors d’oeuvre and dinner will be accompanied by beer, wine, and spirits from Hudson Valley producers. Price: $95 per person includes hors d’oeuvre, dinner, dessert, all beverages, taxes, and service charges (a portion is tax deductible). Reservations: Make a RESERVATION NOW—for questions about the event, please call 845-905-4651. Make a RESERVATION NOW—for questions about the event, please call 845-905-4651. 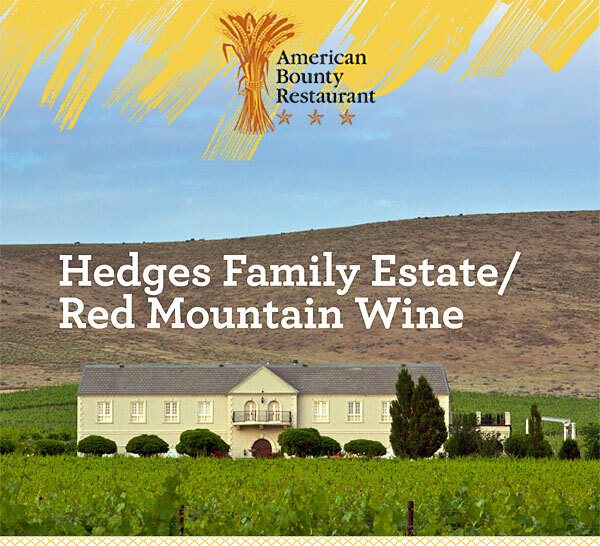 Learn how the Hedges family blends biodynamic farming of grapes and the unique terroir of the Red Mountain area of Washington State to create gorgeous wines. At the Danny Kaye Theatre, you'll taste and learn about these award-winning vintages. To reserve by phone, call 845-451-1014. 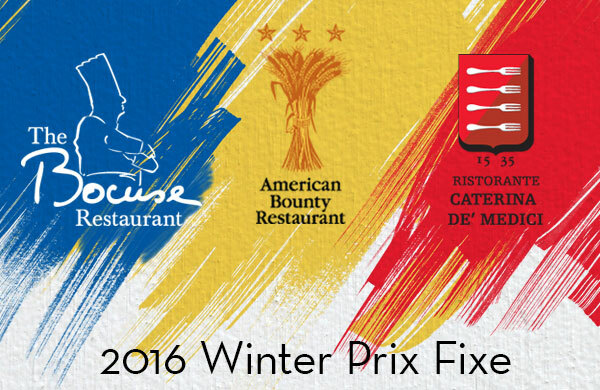 The Culinary Institute of America Price Fix Saturday @ Ristorante Caterina Saturday, December 6 & 13, 2014 7:45–8:30 p.m.
Ristorante Caterina de' Medici is open. 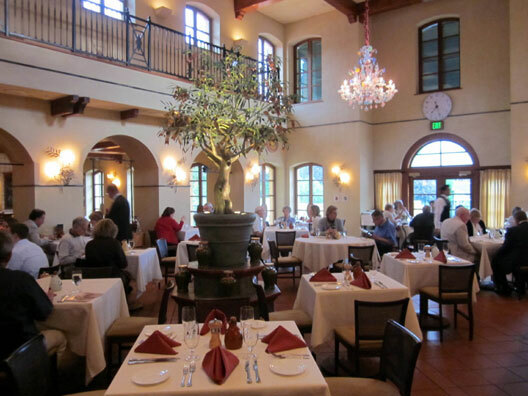 Take advantage and enjoy family-style salad and antipasto, five pastas served table side, and dessert. So don't miss the chance to join us on December 6 or 13 for a very special prix-fixe dinner. To reserve by phone, call 845-451-1013. To reserve by phone, call 845-451-1101.